Venezuela's oil industry is about to suffer the same fate as Cuba's once lucrative sugar industry. The parallels between Cuban sugar and Venezuelan petroleum are striking (LD). Between Fidel Castro’s Cuban Revolution and the collapse of the USSR, a socialist economy impoverished and weakened that Caribbean island “showcase of socialism,” all the while concealing much of the lack of coordination and low productivity, by means of Soviet subsidies. The Eastern Bloc subsidized its prized Latin American satellite state by undervaluing massive amounts of their exports to Cuba, and vastly over-valuing Cuban sugar. By means of this massive “sugar subsidy” the Soviets ended up transferring an astounding USD $19 billion to Cuba between 1961 and 1988. The USSR was a military superpower with extensive geographic, natural, and human resources, which propped up a small and unproductive socialist economy, unviable in the long term. The Soviet Union’s fall ended the Soviet subsidy to Cuba. And the Cuban socialist reality became visible. With respect Cuba’s critical sugar industry it was remarkable: remarkably and astoundingly bad. Cuban sugar production fell from 7 million tons – roughly 7% of world production – to 1 million tons – less than 1% of world production. It fell in terms of the number of hectares harvested, and in yield per hectare. Both production and productivity declined precipitously. In 1958 Cuba supplied 37% of the US sugar market, with 161 sugar mills: 62% owned by Cubans and 36% by Americans. In 2011 there were 51 sugar mills, all owned by the Cuban State, but only 39 were in operation at harvest time. 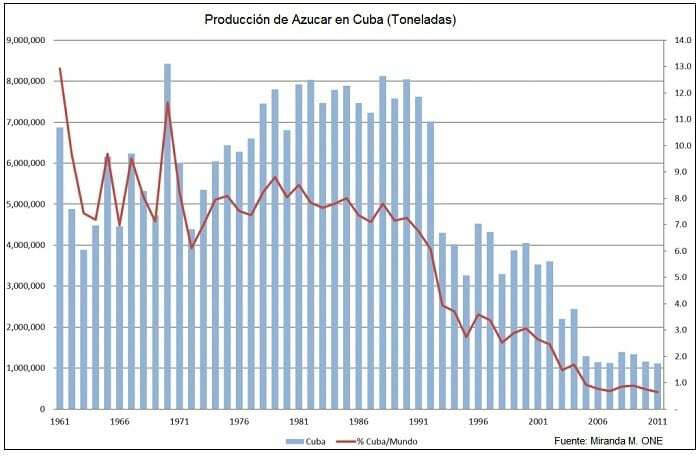 The Cuban sugar industry, (the one that Fidel Castro announced that through socialism would produce more than 10 million tons per year and quintuple its productivity), is close to disappearing. The history of the rapid socialist destruction of the Venezuelan oil industry is similar, but Venezuela has never received subsidies from a socialist power in an attempt to use it as a showcase. It, in fact, has been subsidizing other regional allies, with its oil. It is currently in the midst of deep structural economic destruction wrought by socialism, and reckless foreign policy. Chavista Venezuela has long subsidized Cuba, and participated in Castro’s project of continental expansion: the Forum of Sao Paulo. Socialism denies reality and facts, and will ultimately lead to the collapse of any economy in which it is implanted. In Venezuela we are today seeing a sustained drop in oil production: a lack of maintenance and investment. In May, the press reported that production was dropping between 90,000 and 150,000 barrels per week. It was estimated – then – that although PDVSA was obligated to set aside 1,490,000 daily barrels for export commitments, it currently is only able to allocate 694,000 barrels per day, for export. And the only reason it is not even more dire situation, is due to the massive drop in domestic fuel consumption – the result of the fall in economic activity – which is explained by the fact that while the Venezuelan government essentially gives away oil to its citizens, we also suffer from shortages of lubricants and spare parts. More than half of GDP has disappeared. Industrial plant are operating at less than 50% of their capacity. And the massive power shortages are a major limiting factor in all industrial matters. Border black market gas prices are discounted from the domestic consumption due to the huge price differential; although the Venezuelan government is attempting to stem the lucrative black market oil trade through severe rationing of fuel in the border states. OPEC reports that Venezuelan oil production was at 1,533,000 barrels per day in May. The report states that some external sources had reported production of 1,390,000 barrels per day. PDVSA currently owes future oil, with which it has already paid for imported merchandise and/or import credits, to China. It owes oil to Russian companies. It is only earning hard foreign currency from its exports to the United States and India: this amounts to volumes between 300,000 and 400,000 barrels a day to the United States, mainly to its subsidiary Citgo, and just over 300,000 barrels a day to India. PDVSA should be allocating not less than 300,000 barrels per day to China to pay its debt obligations. The announced goal was one million barrels a day to China to renew and expand credits for new imports. It is not happening. PDVSA lacks the necessary crude to process in local refineries and has had to import fuel for power generation, which in turn depends on production and refining. Today, PDVSA crude is being transported around the Caribbean under the threat of an embargo by Conoco Phillips. Venezuela has a debt of USD $2 billion dollars to the oil company, and it is threatening its lucrative seaports in Curaçao, Bonaire, and San Eustaquio, as well as the La Isla refinery. Under normal circumstances, PDVSA would have been easily able to resolve its debts with foreign creditors and companies. Venezuela lived through an extended period of oil bonanza. But Chavez and Maduro destroyed the oil industry, and ruined the internal finances of PDVSA, once the envy of the region. There was much hope that reserves of bitumen and heavy crude oil in the Orinoco belt would allow production to recover. But the Orimulsion projects – a fuel alternative for coal or more expensive liquid fuels for thermoelectric plants – were abandoned on Chávez’s orders. Reversing the fall in production implies investments – in the marginal areas as well as currently profitable wells; but profitability margins are falling increasingly due to the Chavista regime’s corruption. In the short term it would not be impossible for them to reverse the fall by attracting foreign investments at very high risk, although this would be unsustainable in the long term. If Venezuela remains under the yoke of revolutionary socialism, the Venezuelan oil industry will suffer the same fate as the Cuban sugar industry. The industry and its machinery will be transformed into scrap metal, and reduced to insignificance. The signs are already in sight. Guillermo Rodríguez is a Venezuelan researcher at the Juan de Maria Center of Political Economy and a professor of political economy at the Institute of Managerial Professions in Caracas.